Cast Iron Dutch Ovens were multi-purpose in the kitchen long before the multi-cooker came into the market. Original Cast Iron Dutch Ovens were known to be heavy, thick-walled and made of raw cast iron but that has since changed. 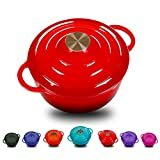 Nowadays, you will find the French enameled coating ovens and other squat pot being marketed as Cast Iron Dutch Ovens. However, most of these ovens are made of thin metals and don’t work as perfect as the original Cast Iron Dutch Ovens. This article will help you select the best Cast Iron Dutch Ovens by reviewing some of the best in the market currently. 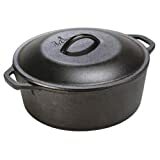 The Lodge is an original Cast Iron Dutch Oven with dual handles for easy handling and a 5-Quart capacity. It has a self-basting lid that helps preserve the moisture inside and cook your food fast and evenly. The rugged iron-cast construction helps the oven heat and cook slowly giving you good tasting meals. Pre-seasoned with vegetable cooking oil. This makes it ready for use. 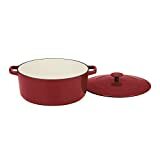 The EC6D43 Lodge is a 6-Quart Dutch Oven that has been made of the heavy cast iron and finished with smooth chip-resistant porcelain enamel. It is an appealing addition to your kitchen with side handles for safe gripping. A further secure grip ensures you carry it with confidence. The surface glass is smooth and will not react with ingredients. This 5-Quarts Lodge Dutch Oven comes pre-seasoned and ready for use out of the box. It has a special coiled handle for easy lifting and transportation. The lid of the oven fits tightly and keeps the food moist throughout. It is easy to clean and maintain. You can hand wash it with hot water and a stiff brush. This Lodge is an 8-quart deep oven that can be used to cook large amounts of food at ago. It has a flanged lid that can be used to hold hot coals and be as a griddle. Integral legs allow the oven to sit stably in the camp as you cook. It is a quality Dutch oven made in the USA and one that comes pre-seasoned for use. 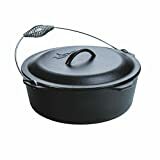 It is a high-quality design Dutch oven that I recommend for anyone looking for good value for money. The L8DD3 Lodge oven is a sturdy choice that comes with integrated handles on the base of the lid and top of the oven for secure transport of the oven. The cover converts into a 10.25-inch skillet making it a versatile pick. It is a safe and pretty simple to use often with hand washing recommended. The Lodge L12CO3 is a 6-quart Dutch oven that comes ready for use in campfires. It is a seasoned cast iron oven that is ready to use out of the box. The cast iron lid can be inverted and used as a griddle making it a versatile pick on our list. With a 12-inch diameter and 3.75-inches deep, the Lodge L12CO3 is large enough to cook large amounts of food. Overall, it is a quality product made in the USA to the highest standards. This is an imported Dutch iron cast from Europe and Japan and one that has undergone a great embedding to create a smooth a soft surface. It is a great selection with a flash melting point that extends its lifespan. This oven uses the flash melting technology which helps improve the abrasive resistance and make it a durable pick. The Lodge L12DO3 is a high-capacity Dutch oven with an 8-Quart capacity ideal for parties and holidays. The oven uses the heavy gauge wire bale that acts as the handle for safe carriage. It is a well-made oven that distributes heat well. A self-basting iron cover further helps keep the heat and moisture within. It is seasoned and comes ready for use. The 14-Inch Camp Chef Dutch Oven is a true professional in cooking meals that are tasty and yummy. It is a durably constructed oven with a lid that has legs. The lid can be used as a griddle. A built-in thermometer notch helps set the ideal temperature setting for specific foods. This is an oven that comes ready to use and easy to maintain. The Cuisinart Chef’s Classic is by far the best Dutch Oven of the year and a great choice that does its job well. It is a durable cast iron oven with superior heat distribution and retention capabilities. This oven is extremely versatile and can be used for cooking, entertaining and serving. The exterior is enameled porcelain rich in colors and a great addition to any kitchen. It is dishwasher safe and convenient to clean up. Take your cooking to a whole new level by ordering any of these Cast Iron Dutch Ovens today. They are the best selections in the market so far giving you quality, durability, and value for money.